Projects with 31st of December deadlines should be started well in advance of the holiday vacation time crunch. To most this is blatantly obvious. Some of our peers, however, act surprised that Christmas comes on December 25th every year and that most people take time off around that time. (Some folks take a LOT of time off!) I was astonished by the number of messages I received on 12/27 regarding projects with deadlines of 12/31. There is an ancient fable that illustrates this situation: The Ant And The Grasshopper. Now, don't get me wrong. I am firmly in the camp that believes that ALL of IT is one team, and we all succeed or fail together. And to get even more macro, the entire company stands or falls as one. So, yeah, though it might seem otherwise, I AM a team player. But what does that say about the person who hasn't managed their projects properly and are now looking for you to bail them out? Does that make them a good team player? How is the greater team helped by someone who doesn't properly manage projects with cross-team dependencies? Or, at the least, ask for help prior to crunch time? Resources have to be diverted, which then impacts quality and timeliness of on-track projects. A crisis on your part does not constitute an emergency on my part? Now, don't be a jerk about it, but, as a manager you're going to have to decide how much you can assist at this late point in time. The right thing to do, of course, is to help your fellow human being. There are plenty of metaphors equating the corporate world as a brutal jungle, but I hope that your workplace isn't a Darwinian struggle for survival. There is a corollary to the section title above: Poor planning on your part does not constitute an emergency on my part. The bottom line is that you shouldn't get into this situation in the first place. Plan for contingencies. Look at a calendar when you are planning a project schedule. If YOU are the one that has run out of time it's always better to admit that you're not going to complete the task(s) at hand on time. I am not claiming that I'm covering new ground with this post. I'm merely describing a management anti-pattern that seems to be popular in some organizations. Finding the .NET 4.5 SDK didn't sound too hard to do. 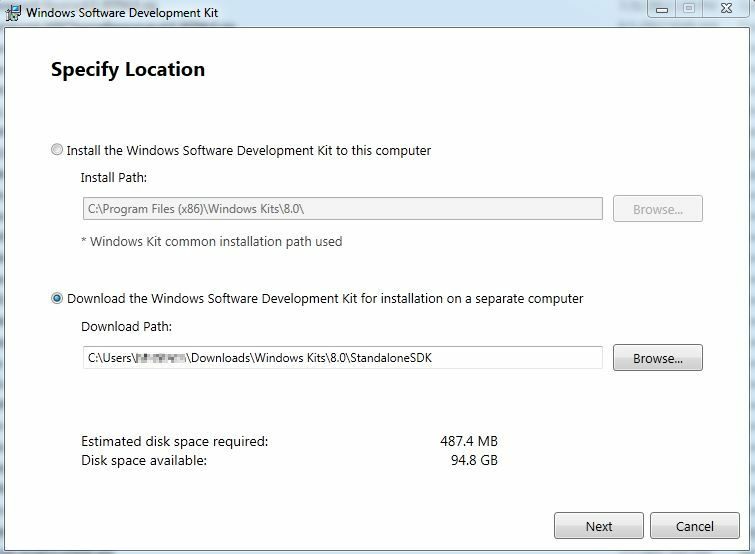 It wasn't, and I learned that it was part of the Windows Software Development Kit (SDK) for Windows 8. 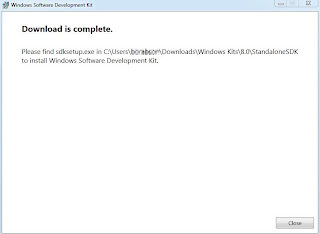 I downloaded the indicated file, which was named sdksetup.exe. 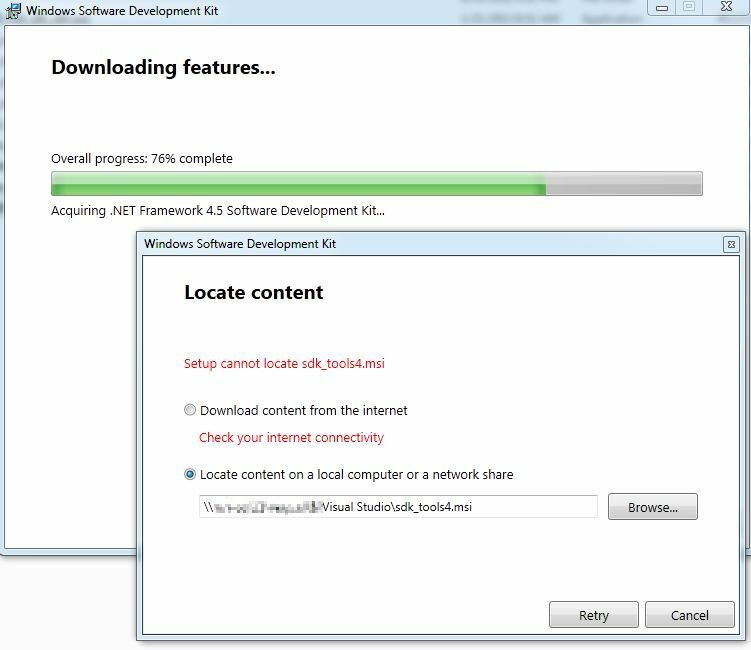 Its size hinted that unfortunately it wasn't a standalone installer but (ugh) a web installer. 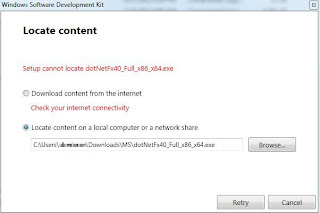 I gave the sdksetup.exe a go on the server but wasn't surprised that it failed due to lack of internet connectivity through our proxy server. My next idea was to either extract the files that I needed locally or install and then copy the files to the server, which has worked before. 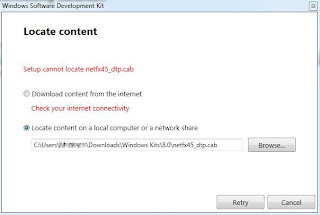 I missed it the first time around, but the Windows 8 SDK had an option to download the required files for installation to a separate computer see ('.NET Framework 4.5 SDK Tools on Windows Vista and Windows Server 2008' after the jump). 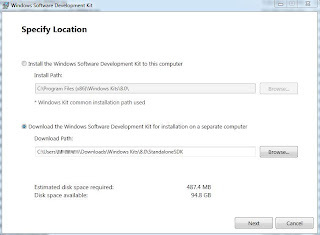 This is important because- and I missed this initially as well- "The installer for the Windows SDK for Windows 8 is not supported on Windows Vista and Windows 2008 Server." Well, that's pretty cool that I can create my own installer, I thought, and away I went. I appreciated being able to deselect all of the stuff I wasn't going to need on a build server. Ugh. More proxy issues, even locally. Shades of Mordac! 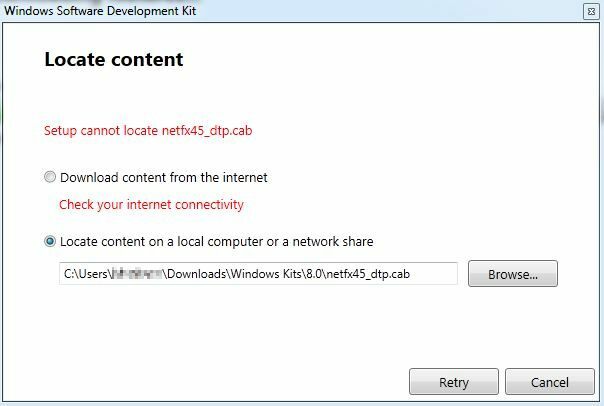 I could easily download the .NET 4 redistributable though, so I was still undaunted. Now things started to get silly. 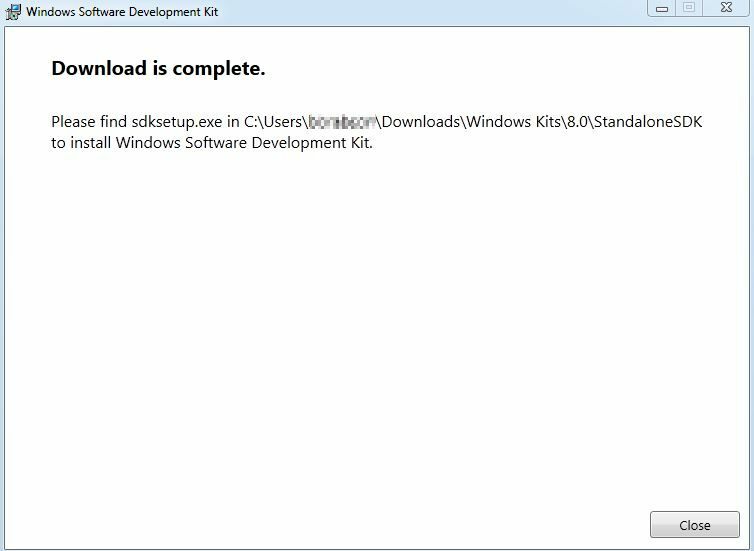 Where was I supposed to find sdk_tools4.msi? Searched Google, other folks were wondering the same thing. Maybe I already possessed sdk_tools4.msi and didn't know it. Everything proved that theory valid. Hoorah! Now I could build my SDK installer, get the builds rolling, and move on. It wasn't to be. After browsing to my local copy of sdk_tools4.msi and clicking Retry, the SDK builder process gracefully prematurely ended, mentioning something about 'bad payload' or the like. Sdksetup.exe revealed an important secret at this point: a log file! Mine was located at 'C:\Users\[Username]\AppData\Local\Temp\standalonesdk'. The file was thankfully extremely verbose, and I could see all of the failed web requests for various resources. I then plugged the URL into a browser which then prompted me to download the file. After downloading, I then specified the location of the file in sdksetup.exe and clicked Retry. It took about 10 minutes or so to get all of the files. Not the most elegant of solutions but hopefully this wasn't something that I was going to have to do often. Finally I was finished. But would it work? 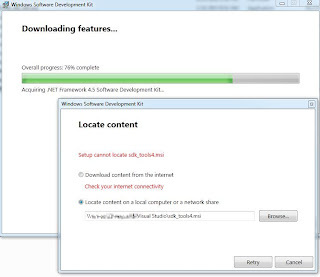 I copied my new .NET 4.5 SDK installer- and supporting files- to my Windows Server 2008 R2 build machine. I then queued a build, which subsequently completed successfully. Recently I was reviewing a production issue with one of my developers that involved 'bad' data from a third party application blowing up one of our proprietary processes. We do a lot of ugly 'data proctology' like this and don't have a lot of control on the front end. It is what it is. Our conversation caused me to revisit several old topics. "Garbage In, Garbage Out". GIGO. It's an ancient phrase when you consider the short lifespan of computer technology. Many refute the validity of this concept. The argument is that 'bad' data shouldn't be allowed into a system in the first place, and if it does make it in then it is a failure on the developer's part. I tend to agree, and defensively program to prevent GIGO. There are many testing techniques- automated and manual- that can also help preventing GIGO. Unfortunately, I've yet to be employed by someone who permits the time to develop comprehensive automated test suites because of the time required. Companies have slowly admitted that Quality Assurance departments offer a positive ROI, and I hope that they come around regarding automated testing as well. If we hire people to test our software then we'll have a higher quality product. If we have a higher quality product then we will spend less time working on defects. If we spend less time working on defects then we will have more time to develop new features and enhance shareholder value in ACME Corporation. Our production issue had taken us beyond GIGO into the realm of GINO ("Garbage In, Nothing Out"). Our process crashed as data was extracted from the source application. And here is where I think that we could do a better job defensively coding around the input and gracefully failing if absolutely necessary. Since we don't have a user interface- or a user!- we can't just present a validation failure message or the like. (The source application is quite deficient in the area of input validation anyway.) Fuzz testing might be one technique that could harden our vulnerable process. While this might seem like overkill, we unfortunately don't have total autonomy over how some of our processes are consumed so would need to test for a wide range of issues. I recently encountered a new variation of GIGO that involves requirements. Insufficient or overly broad requirements yield garbage as easily as bad input data.